The wine we are going to review today is another Bordeaux-style blend with the label ‘Made in Moldova’ – a wine that has acquired a legendary status over the years – Lupi 2014 by Gitana Winery. 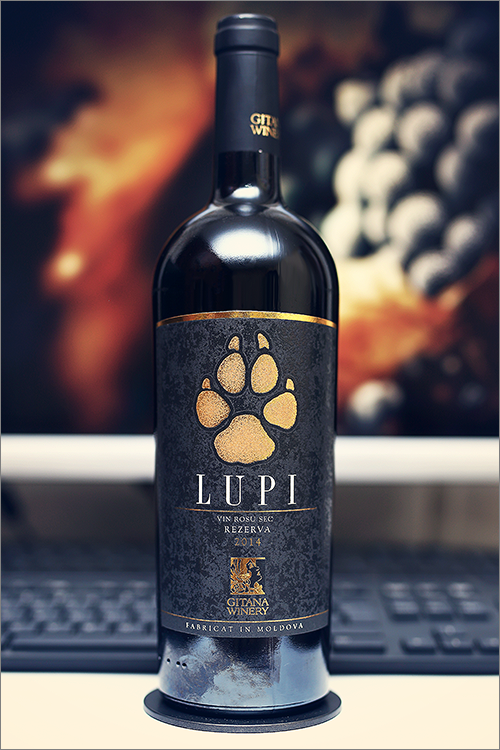 Named after a pack of wolves that settled in the area where the grapes are grown, Lupi (which literally means ‘wolves’) is the winemaker’s flagship wine – a blend of cabernet sauvignon, merlot and saperavi, aged for 24 months in big russian oak barrels, followed by another 6 months in american oakwood casks. But enough with the theory part, without further ado, let’s move on straight to the tasting! Deep and noble garnet color, not too deep, with elegant ruby shades towards the rim of the glass. The nose is strong, filled mostly with ripe black fruits flavours: ripe black mulberry, overripe fig, black plum, ripe sour cherry, black cherry, black raspberry, blackcurrant, ripe blackberry, dried fig, black cherry jam, dried cranberry, black mulberry jam and nuanced leathery notes. An instant later the nose is filled with elegant notes of roasted oakwood, red and black pepper, sweet tobacco, nutmeg and subtle hints of cinnamon. The wine is medium-dry, with high alcohol level, high acidity and ripe tannin. It feels slightly sweet, bold and tannic, with a very nuanced fruity-leathery accent – a real crowd pleaser. This is a quite spicy, extracted and overripe wine, as it tastes seedy, supple and extracted on the mouthfeel – a fine example of a new-world style blend. The wine has a fair overall balance and a well structured, a bit woody mid-palate. It has a long finish and a very balanced, sweet and seedy aftertaste. This is definitely a fine Wine of Moldova and the overall rating says the same, with 91.1 points scored it is right there, among the best wines we’ve tasted so far. Please click on the chart icon on the left in order to get to the wine rating page, where you can find all the wines we’ve tasted to date. Conclusion: this is a fine and very appealing wine on the summit of its prime form – a wine that can still age for another year or two, yet we would strongly recommend to drink it now, as we consider it the right time to uncork it. The wine has a fine tannic grip on the mouthfeel, leading to an elegant mid-palate and firming on beautifully with a quite velvety finish. Despite all its elegance, this wine lacks a bit of complexity, still, it has a very nice balance between fruit and wood, where neither dominates over the other. In order to amplify its finesse, we would recommend to pair this wine with slightly sweet meaty dishes, like for example tournedos rossini or beef carpaccio with soy sauce. Enjoy!